Copper Tanning in Herriman has committed to donating the days proceeds to our project. There will be giveaways and other things going on in the parking lot. The attached flier gives all of the information needed. We as a community are coming together to help the Green family by raising funds to build them a home for all of their children! The Greens have 8 children (3 biological and 5 adopted from China). They will be adding two more children in the coming months. Cali was born with Spina Bifida and depends on a wheelchair to help her get around. Conner is blind. All of the Green's beautiful children that they've adopted have special needs including blindness, severe autism, missing limbs, Cloves Syndrome and heart disease. We have partnered with a non-profit organization, Children and the Earth. 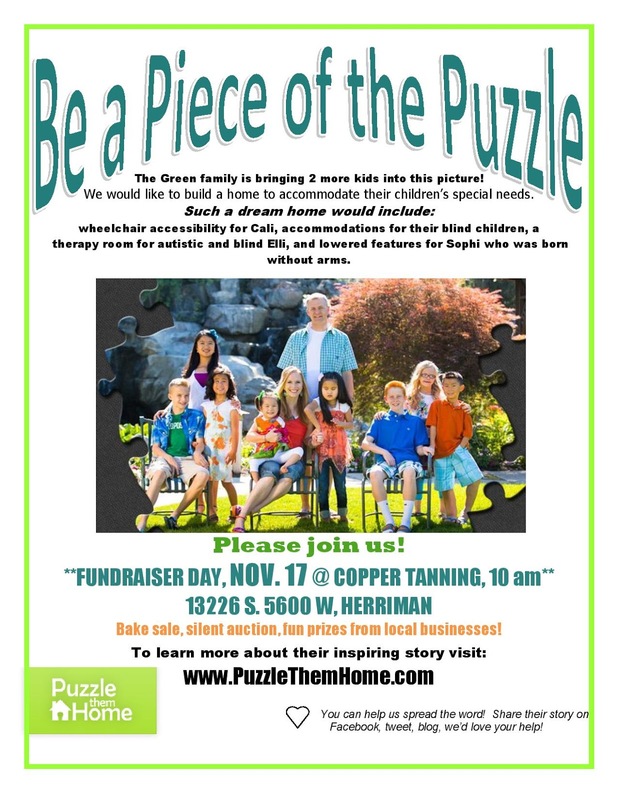 Please visit our website www.puzzlethemhome.org for more information.